The P70 has a potent processor, a versatile specification and a high-quality screen and speakers. It's not cheap, but it's worth the investment if you prize power and practicality over the charms of lightweight, low-power Ultrabooks. The laptop landscape is dominated by sleek Ultrabooks, but we're pleased to see machines such as the Toshiba Satellite P70-A-109 emerge - it's a larger laptop that has more versatility and power than any ultraportable notebook can hope to match. It's built around a high-end Haswell processor, and the rest of the specification is suitably impressive: a discrete Nvidia graphics core, two hard disks, 16GB of RAM and a Blu-ray writer. The 17-inch screen has a Full HD resolution, too. 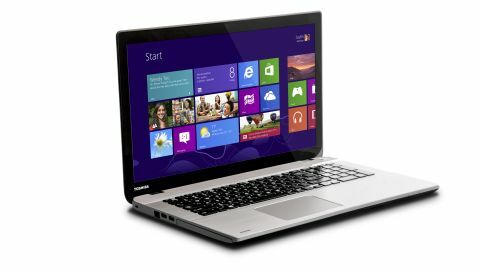 The Toshiba Satellite P70 needs to impress, though, because it's up against some heavyweight competition. The Samsung Series 7 Chronos - now known in some circles as the Ativ Book 8 - includes a powerful processor and a superb 15.6-inch screen in a sleek chassis, and the HP Spectre XT TouchSmart arrives with a swish all-aluminium build. The 15.6-inch Asus Zenbook U500 mixes power with the reassuringly expensive stylings only found in Ultrabooks, and the final contender comes from Gigabyte. Its chunky P2742G has plenty of power, a 17-inch display, and reasonable battery life. The Toshiba doesn't get off to a great start. Brushed aluminium is used for the base and the lid, and it looks good, but much of this machine is made from plastic - something that similarly priced rivals such as the Samsung and HP machines manage to avoid. We don't like the look of the visible seals around the edges, either - it looks cheap in an age where unibody laptops are becoming more popular. Build quality is only average, too - we pressed the base and the wrist-rest and there was a little too much flex for our liking. It's not as if the Satellite P70 is a lightweight laptop, either: its 34.1mm girth and 3kg weight make it bulkier than the 2.5kg Series 7 Chronos and the 2.25kg Spectre XT TouchSmart, and it's not far off the 3.2kg P2742G. So it's not good-looking or light - but the Toshiba makes up for this with practical additions elsewhere. The keyboard has a firm base and a snappy, fast typing action, and the sheer size of this machine means there's room for a full-size number pad and no dodgy layout options - so you get large Return and Space keys. The Satellite P70 allows for more internal access than we're used to seeing from more stylish unibody machines. A single large panel can be lifted away from the base, and it grants access to two RAM slots, the pair of hard disk bays and the wireless card.